ANNUAL broadcast television showings of the 1939 MGM classic musical film The Wizard of Oz have imprinted the story of a misunderstood teenager's journey through a fanciful land upon the American collective unconscious. It reinforces several fundamental American character traits: breathless optimism, willful independence and, of course, belief in the importance of a simple rural home. American Musical Theatre of San Jose's stage production of the famous movie captures these qualities with a solid cast of enthusiastic local performersincluding a couple dozen adorable young munchkins. Unfortunately, the opening-night show was so full of sound problems, dim lighting and botched technical cues that even thrice clicking ruby-slippered heels and incanting, "There's no business like show business," could redeem this Wizard. Audiences familiar with the foibles of community theater might overlook some of these technical problems from an amateur company. From a professional theater organization, such an inability to master the technical elements of theater is unforgivable. San Jose and the Silicon Valley deserve much better from one of their leading arts presenters. AMTSJ artistic director Tim Bair, who directed Wizard, must shoulder the responsibility. 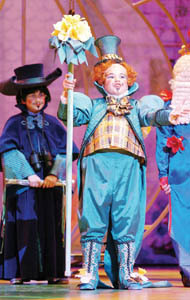 His staging involves a number of challenging effects: flying rigs for Glinda the Good Witch, the Wicked Witch, the Scarecrow and a number of flying monkeys, as well as video projections, pyrotechnics and a raceway encircling the orchestra pit that extends the stage 20 or 30 feet outward toward the audience. Technical director John Draginoff, sound/video designer Hage Van Dijk and lighting designer Tom Sturge's execution of Bair's ambitious staging prove unequal to the calling. On opening night, the flying effects looked klunky and out-of-control. The amplification for scenes on the raceway suffered howls of feedback, great clouds of fuzz or no amplification at all. Lighting on the raceway appeared blotchy at best and often looked as if the board operator had simply forgotten to turn on a bank of lighting instruments. Such inadequate preparation bespeaks poor coordination with the director, too little rehearsal or both. These technical problems are all the more unfortunate as the cast of local theater veterans and a good number of talented young and very young actors, singers and dancers perform quite artfully. Kari Yancy brings a touch of introspection to Dorothy, at times a marked contrast to Judy Garland's wide-eyed archetype. Yancy's capable voice is very charming, too, though her approach often leans toward contemporary pop singing instead of a more traditional Broadway style. James Iglehart as Zeke/Lion plays for a robust character both in dialogue and in song, and his whimpering and preening earn some of the show's best laughs. Thomas Lynch turns in a crafty performance as Professor Marvel/Wizard of Oz, adding a touch of Johnny Depp's herky-jerky mannerisms from Pirates of the Caribbean to the eccentric Professor Marvel. For a legion of munchkins and a field of poisonous poppies, Bair and choreographer Troy Rintala present a darling cast of children whose song-and-dance numbers are highlights of the first act.